The purpose of this paper is to understand the effects of the institutional environment on project outcomes in order to contribute to the accumulating accounting literature on P3s. Based on an empirical study of Alberta’s institutional environment, using Edmonton’s Anthony Henday Highway P3 projects, we analyze how the: a) political environment enables or disenables P3 outcomes; b) policy/business environment impacts project development and implementation; and c) organizational capacity affects P3 outcomes and vice versa. Adopting a neo-institutionalism perspective and a case study approach, we investigate the effects of the institutional environment on P3 project outcomes. This research is based on 35 semi-structured interviews of public sector executive managers, political actors, senior industry executives, project consultants/advisors, labour union, media specialists, community advocates and public policy analysts in the P3 industry who participated in Alberta’s P3 projects from 2004 to 2016. We find that the institutional environment has significant influence on project performance, and program permanence/continuity. Our study suggests that P3 enabling environments present: 1) relevant P3 policy measures and committed political support by field actors; 2) a path-dependent response to project outcomes; and 3) institutional environment elements that are mutually re-enforcing with synergistic effects. 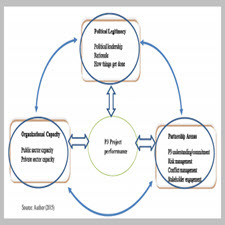 In effect, we document that a strong political leadership support for P3s, a favourable policy environment, and effective organizational capacity are pre-requisite factors for the successful implementation of P3s. Given the unsettled debate about various methodological approaches to value for money (VfM) determination for assessing P3s, we are unsure whether our findings are partly influenced by inconsistent accounting standards for P3s across jurisdictions. Public private partnerships (“P3s”) have become a widely used method for major infrastructure and service delivery worldwide (Siemiatycki, 2013, 2015; Boardman & Vining, 2010; Forrer, Kee, Newcomer, & Boyer, 2010; Loxley & Loxley, 2010; Hodge, Greve, & Boardman, 2010; Grimsey & Lewis, 2004). Several members of the Organization for Economic Cooperation and Development (OECD) and many developing countries have adopted P3s to deliver public services (Burger & Hawskeworth, 2011; Broadbent & Guthrie, 2008; Broadbent & Laughlin, 2005). In 2003, the Government of Alberta (“GoA”) Canada, implemented a P3 policy, by collaborating with the private sector in the design, financing, operation and maintenance of critical infrastructure such as roads, schools, hospitals, water and waste management facilities. هدف از این مقاله شناخت اثرات محیط سازمانی بر نتایج پروژه به منظور کمک به ادبیات حسابداری تجمعی در مورد P3s است. بر اساس یک مطالعه تجربی محیط سازمانی آلبرتا، با استفاده از پروژه های بزرگراه P3 آنتونی هاندی در ادمونتون، ما تجزیه و تحلیل می کنیم که چگونه: محیط زیست سیاسی را قادر می سازد یا رد P3 نتایج؛ ب) محیط سیاست / کسب و کار بر توسعه و پیاده سازی پروژه تاثیر می گذارد. و ج) ظرفیت سازمانی نتایج پیامدهای P3 را تحت تاثیر قرار می دهد و برعکس. با در نظر گرفتن دیدگاه غیر نوستالژیک و رویکرد مطالعه موردی، اثرات محیط سازمانی را بر نتایج پروژه P3 بررسی می کنیم. این تحقیق بر اساس 35 مصاحبه نیمه ساخت یافته از مدیران اجرایی بخش عمومی، بازیگران سیاسی، مدیران ارشد صنعت، مشاوران / مشاوران پروژه، اتحادیه کارگری، متخصصان رسانه، طرفداران جامعه و تحلیلگران سیاست عمومی در صنعت P3 که در پروژه های P3 آلبرتا شرکت می کنند، از سال 2004 تا 2016. ما دریافتیم که محیط سازمانی تأثیر قابل توجهی بر عملکرد پروژه و پیوستگی / پیوستگی برنامه دارد. مطالعه ما نشان می دهد که محیط های فعال P3 در حال حاضر عبارتند از: 1) اقدامات مربوط به P3 مربوطه و حمایت سیاسی متشکل از بازیگران زمینه؛ 2) پاسخ وابسته به مسیر به نتایج پروژه؛ و 3) عناصر محیطی نهادی که با تأثیرات هم افزایی دوباره تداخل دارند. در واقع، ما مستند می کنیم که پشتیبانی قوی رهبری سیاسی برای P3s، محیط سیاست مطلوب و ظرفیت سازمانی موثر، عوامل پیشگیرانه برای پیاده سازی موفقیت آمیز P3s هستند. با توجه به بحث های ناخواسته در مورد روش های مختلف روش شناسایی ارزش برای پول (VfM) برای ارزیابی P3s، ما مطمئن نیستیم که آیا یافته های ما تا حدی تحت تاثیر استانداردهای حسابداری متناقض برای P3s در سراسر حوزه های قضایی است. مشارکت های خصوصی دولتی (P3s) تبدیل شده اند به یک روش به طور گسترده ای برای زیرساخت های عمده و ارائه خدمات در سراسر جهان (Siemiatycki، 2013، 2015؛ Boardman & Vining، 2010؛ Forrer، Kee، Newcomer، & Boyer، 2010؛ Loxley & Loxley، 2010 ؛ Hodge، Greve، & Boardman، 2010؛ Grimsey & Lewis، 2004). چندین عضو سازمان همکاری های اقتصادی و توسعه (OECD) و بسیاری از کشورهای در حال توسعه P3s را برای ارائه خدمات عمومی پذیرفته اند (Burger & Hawskeworth، 2011؛ Broadbent & Guthrie، 2008؛ Broadbent & Laughlin، 2005). در سال 2003، دولت آلبرتا (GoA) کانادا، با همکاری با بخش خصوصی در طراحی، تامین مالی، بهره برداری و نگهداری زیرساخت های حیاتی مانند جاده ها، مدارس، بیمارستان ها، تاسیسات آب و تاسیسات زباله، سیاست P3 را اجرا کرد .